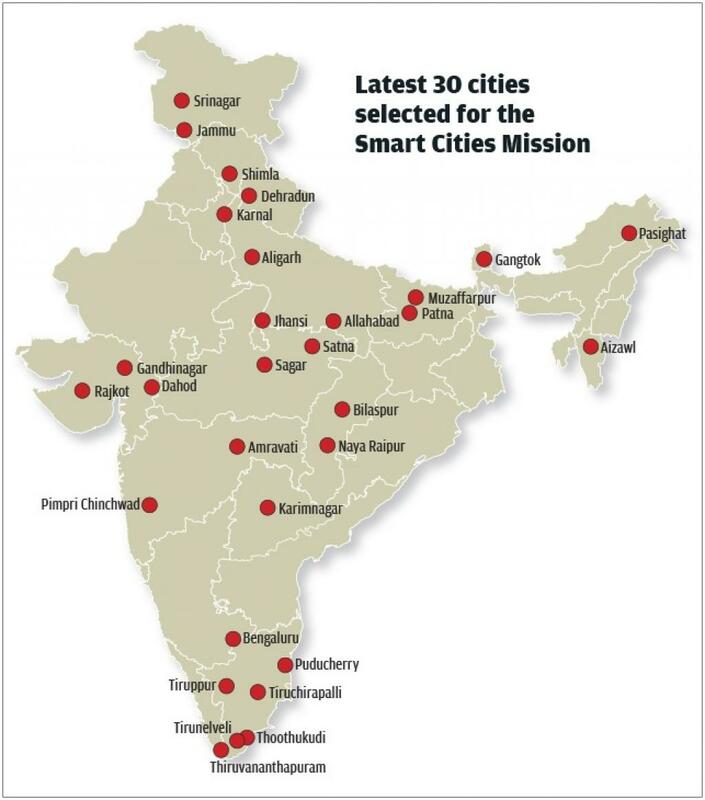 On the occasion of completion of two years of Smart Cities Mission (SCM) and Atal Mission for Rejuvenation and Urban Transformation (AMRUT), the Ministry of Urban Development (MoUD) announced the new batch of smart cities at a National Workshop on Urban Transformation. 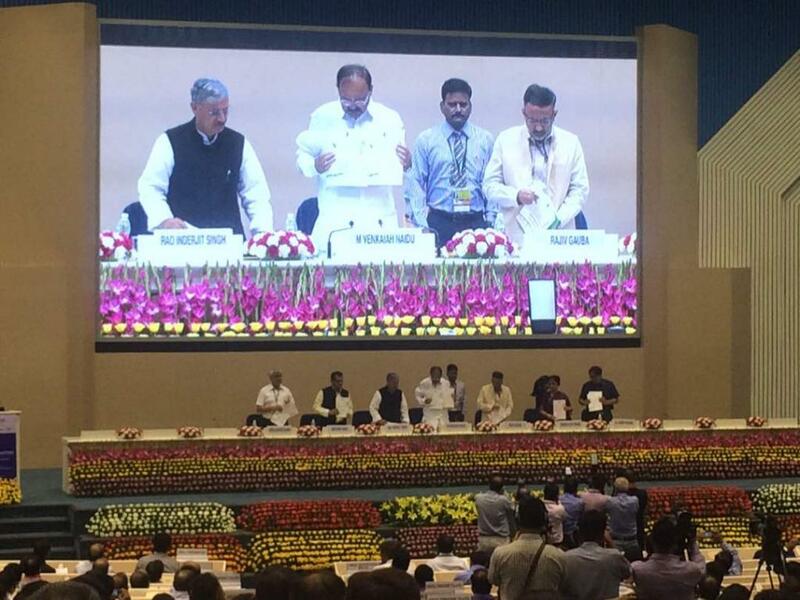 The Minister of Urban Development and Housing & Urban Poverty Alleviation, M Venkaiah Naidu, said that 45 cities contested for 40 available smart city slots but only 30 were selected to ensure feasible and workable plans that match the aspirations of the citizens. “The mission is an echo of urban revival,” the minister said. Creating smart cities would entail development of basic infrastructure like adequate water supply, electricity supply, sustainable sanitation and solid waste management mechanism, efficient urban mobility, affordable housing and ensuring robust IT connectivity and e-governance. The mission aims to build and transform urban India. What is the progress till date? According to the information given by the MoUD, 30 cities announced today, proposed a total investment of Rs 57,393 crore under respective smart city plans. This includes Rs 46,879 crore for ensuring core infrastructure in the areas identified by citizens for area-based development and Rs 10,514 crore for technology-based solutions for improving governance, service delivery and utilisation of infrastructure. With this, the total investment approved under the smart city plans of 90 cities has gone up to Rs 191,155 crore. So far, 800 projects worth Rs 34,000 crore are under various stages of implementation, whereas work will start soon on 123 projects worth Rs 3,758 crore in the cities selected till the second round. Work has already commenced in 115 projects worth Rs 4,500 crore. The government is planning to inaugurate 100 more projects worth Rs 3,205 crore. The quantifiable progress and implementation of few projects as reported by the ministry is given below. Various projects have been taken under public-private partnerships. What is City Livability Index? The MoUD also released the City Livability Index, which is a set of indicators to assess the livability standards in cities. The index shall rate cities in terms of development and how livable they are based on four broad pillars: physical (45 per cent), institutional (25 per cent), social (25 per cent) and economic (5 per cent). Some of the parameters on the basis of which the livability in cities shall be assessed include: governance, health, safety and security, education, solid waste management and waste water management among other others. Muzaffarpur was selected as a smart city today by the MoUD. This nomination is a step in the right direction as it will provide the necessary finances and impetus for Muzaffarpur to transform itself into a city of the future. The announcement also provides vital encouragement for the Centre for Science and Environment (CSE), which has been helping the city adopt a modern decentralised waste management system. On December 15, 2016, the ‘Swachhtha Swasthya Samridhi’ programme was launched in Muzaffarpur. Under the programme, 49 wards of the city shall be transformed into clean wards by September 2017 through the joint efforts of CSE and Muzaffarpur Municipal Corporation. CSE is also working on wastewater management in the city. Till date, seven wards of the city have started segregation at source and have adopted decentralised waste management. 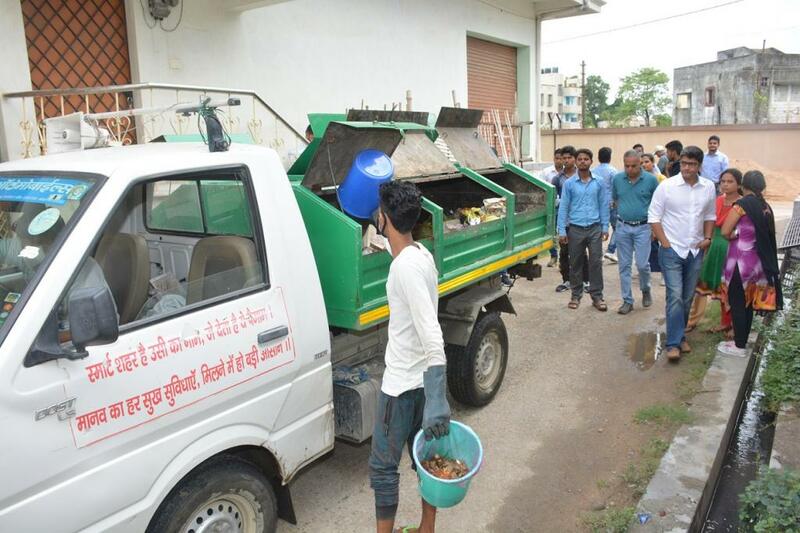 Waste collectors in these wards are being incentivised to collect segregated waste. The food waste is being composted whereas the dry waste is channelised to recyclers. Six months from now, waste collectors in every ward will be trained and volunteers will propagate the message of segregation at source across the city. In addition, Muzaffarpur is also planning to adopt a modern decentralised system of wastewater management. “We want Muzaffarpur to be quoted as an example of effective waste management and sanitation in Bihar—a model that can be replicated in not only other cities and towns of Bihar but the whole of North India,” said Chandra Bhushan, deputy director general, CSE. “Our goal is to make Muzaffarpur one of the cleanest cities in India,” he added. What is in for the new smart cities? Under the SCM, the selected smart city shall receive Rs 500 crore over a period of five years by the Centre and State respectively. While Rs 200 crore will be disbursed in the first financial year after selection, the remaining will be given in three installments of Rs 100 crore each every year. This amount shall be allocated for redevelopment of city and for pan-city development, with special focus on sectors like e-governance, energy management, waste management, water management, infrastructure development (roads, rails) and other projects such as establishment of skill development centres, tele-education services and trade centres. Also, the approach of the SCM is not ‘one-size-fits-all’. Cities are free to formulate their own concept, vision, mission and plan (proposal) for a Smart City that is appropriate to its local context, resources and levels of ambition. An analysis done by CSE points out that so far, the SCM ensures and supports development in less than five per cent of the area in a city. These Smart Cities are expected to replicate and extend such models in other parts of their cities. The SCM also converges with other government flagship programmmes such as the Swachh Bharat Mission (SBM) and AMRUT. The key difference between AMRUT and SCM is that cities may take up the funds for core infrastructure development for the full city under the AMRUT programme and choose areas for development under the Smart City Mission. The selected cities are also undertaking projects under SBM to ensure improvised sanitation and solid waste management conditions in these cities. The biggest challenge under SCM is to push for sustainable development. Also, the process needs to have a fair pricing mechanism as the cost of living in the smart area of a city surpasses cost of living of other areas within the city. This needs to be addressed to make it affordable for a smart city concept to be meaningful and sustainable. According to a previous study conducted in 2016, the government’s focus is on institutional and physical infrastructure (including governance). Nearly 21 per cent of the funds are allocated to water, waste management and sewerage, while roads and mass-transit have been allocated the remaining 79 per cent. There needs to be an equal distribution and allotment of funds to build cities of the future. What’s the progress of Smart Cities Mission? As far as mass transit is concerned, the emergence of metro trains across major cities in the country and the fares charged by them. When the metros charge starts at Rs 10 (From my search in Chennai, Kochi and Delhi) for approx. 1km (1 station) to Rs 30 or 40 for approx 10 km whereas approx. operating cost of a bike is only Re 1 per km and life time cost of a bike would be around Rs 2.5 per km. With this scenario how many are really going to switch to the Metros? Whereas per capita emissions from a bike(without pillion) is about 8x more than train. How does it is make sense ? Second is the width of compartment which only about half of normal trains in India aping the West when our city population density is more 3x more than most western countries. Wish CSE does a more detailed study it. ( Note even monthly parking fare for car in Chennai metro is Rs 500 whereas even in MRTS it is Rs 2500. It is nothing but further incentives to the richer and the bigger polluter).